Make the most of your relaxing Brian Head, Utah retreat with a stay in our beautiful, 450-square-foot, One-Bedroom Villa accommodation. Perfect for families of four, enjoy the luxury of a private bedroom featuring a plush king-size bed, and in the living room, a conveniently comfy queen-size sleeper sofa. With spacious interiors, this accommodation has everything desired for your mountainside home away from home in Brian Head. Including a cozy fireplace, an inviting living area for family gatherings, a TV for movie night and a full bath with jetted tub, ideal for a long, hot soak after a full day of nearby outdoor recreation. 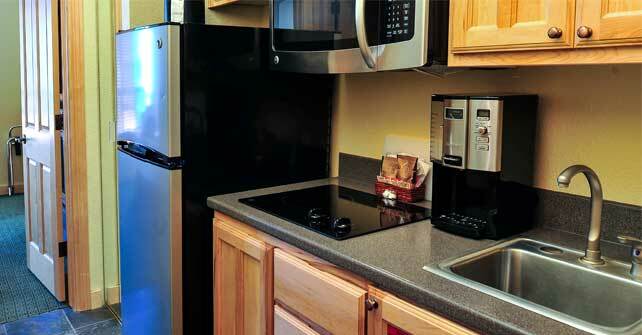 Meal prep is made simple in our well-appointed kitchenette featuring a refrigerator, sink, microwave, two-burner stove top and a coffee maker.